The long awaited summer weather and the Dutch world cup soccer team are on a roll. In a short while I’ll be continuing my Friesland tour from Sneek, through IJlst, across the Fluessen to the old Zuider Zee port of Stavoren. I watched the Dutch defeat Slovakia yesterday afternoon at the home of my cousin Siebold. 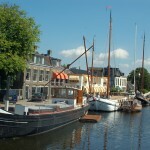 Just around the corner from their home is the Friesland Maritime Museum (Friesche Scheepvaart Museum). I spent a few hours there. It contains a couple of collections that I had always wanted to see. 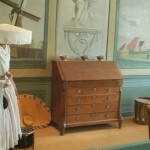 One of them is the complete interior of the living room of a well to do farmer-merchant family in the town of Ypecolsga, which is just 5 miles from Sneek. This farm home still exists and I show below a picture of a family reunion in August 1993 at this farm house. This is also one of the last pictures of our mother. The lady seated far right. She died at the age of 92 in December that year. I am standing in the back next to my twin brother Jan (Jan with tie). This farm has stayed in de Vries family continuously since the early 19th century. The interior dates back to that period and was gifted by the family to the museum at the time of a renovation of the farm house. 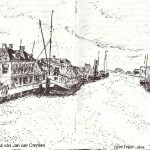 The Tromp family branch in Ypecolsga operated a fleet of Kofschip ships and owned a shipyard in the town, of which you will see a painting in the below pictures. The museum has some of the best displays of models, paintings, rigging, tools, etc. 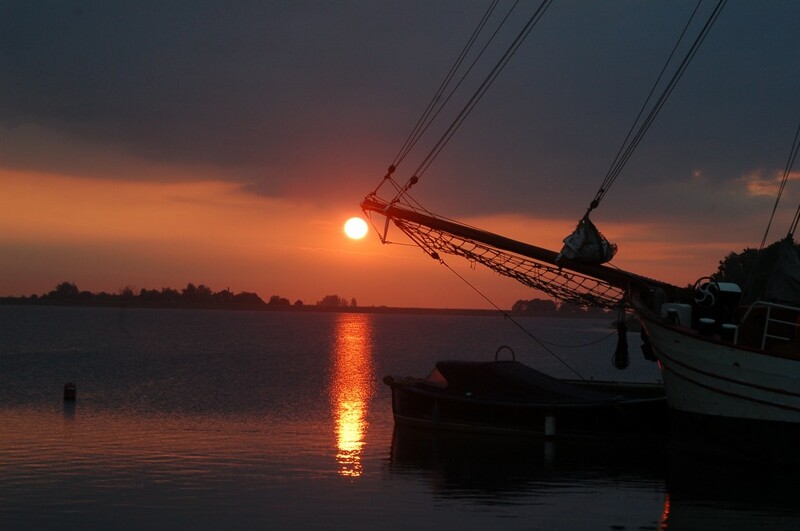 of the Golden Age of Friesland’s maritime past. It also inventories a wealth of old records. 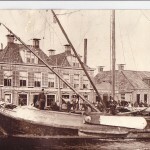 My cousin Carol de Vries has donated an extensive record of nearly a 100 year old documents and correspondence kept of the de Vries mastmaker’s business, which started in Ypecolsga-Woudsend in 1802. 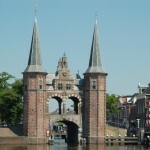 The Water Poort (Water Gate) is famous for the Elf Stedentocht (11 cities tour) a 200 k.m. long ice skating event that goes through all 11 Frisian Cities. 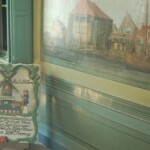 interior of the de Vries farm house, painting shows resemblance with 1993 reunion picture. 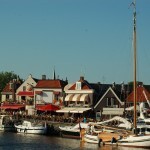 Sneek (or in the Frisian language Snits) is one of the the best preserved of the 11 cities in Friesland. As the pictures show it was a beautiful boat ride, first through the heart of Lemmer, with three bridges then through the Princess Margariet Canal through the dairy farm country side, across several lakes. On entering the city of Sneek the canal leads across an aquaduct, this time I got to look down on the car traffic beneath instead of the odd sight from the highway of boats sailing across the motorway. I never got to see the interior of the Dutch Reformed church. It was the turn of the Christian Reformed church. An unattractive less than a 100 year old building. I attended the 9.30 a.m. service long enough to make it to 10 o’clock mass. But I had a chance to sing my heart out with familiar songs. 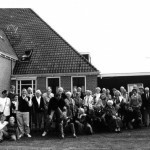 Can these Frisian Reformed sing!! No doubt about where my voice volume roots were laid. The Saint Willibrordus church, built in 1901, is an attractive neo-gothic structure; just around the corner from where my mother grew up. It has a very nice organ and good acoustics. But the congregation’s singing can’t hold a candle to their protestant brethren. Roelie and Jan Spanjaard came to Lemmer from Drachten to meet me and see the boat. 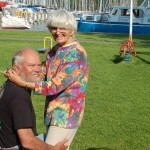 Roelie’s father was a fisherman in Lemmer and she maintains a web site about the history of Lemmer. 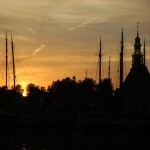 I arrived in Sneek in the early evening and spend it was near midnight before I got back to the boat from a delightful visit at my cousin Siebold and his wife Tineke Hartkamp. They live in the old center of the city in an old ” brown stone” that they lovingly restored. Siebold has been the mayor of Sneek several terms. 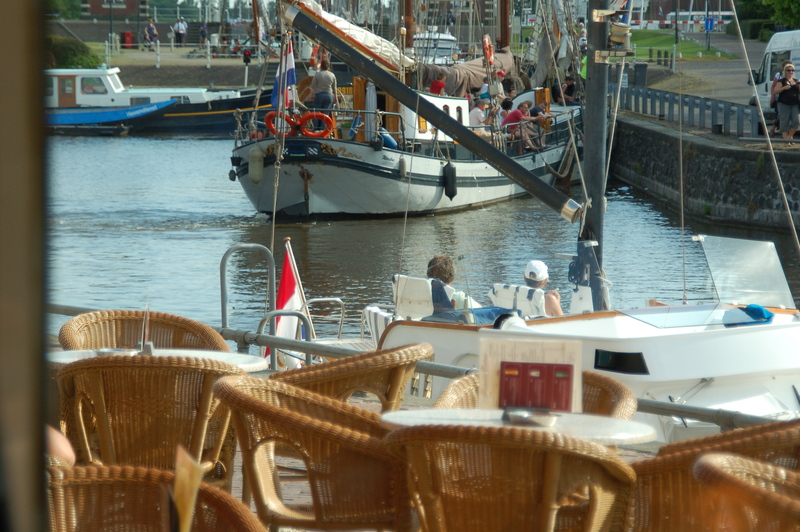 They will come to the boat for coffee and then I have several places I’d like to visit here, in particular the Frisian Maritime Museum. At 4 p.m. Holland plays Slovakia in the semi-quarter finals of the World Soccer Cup. I will probably get my orange wig and vuvuzela to watch the game at the Hartkamps. After dinner I expect to meet Henk Nauta who also lives in Sneek, he and his wife Hanny have followed the same route I plan to take next month down the Danube. Then tomorrow I’ll follow a different route back to the Ijselmeer, through Stavoren. This promises to be a treat like yesterday crossing one large lake with a dredged channel. It is 16.30 and the carillon at the old Dutch Reformed Church is playing Old Lang Syne…… The Sunday service at this church is at 9.30 and I promise pictures of the service on my next blog. If they happen to have the service there. The two (Dutch and Christian Reformed) Reformed churches and the Lutheran Church united into one church about 7 years ago. And now they alternate services every other Sunday. And they still can’t fill the churches. It will be a surprise where I end up. I hope that it is the Dutch Reformed because it has an exquisitively carved pulpit and gorgeous copper candelabras. 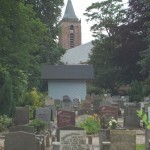 There is a family story on this church in de Lemmer. My great grandmother Rinsje de Vries- Ages was a staunch Dutch Reformed. And when my grandfather married the daughter of the Christian Reformed pastor on the island of Urk she was not a happy mother/mother in law. Minister daughters do not bring any money with them into the family. My grandfather placated his father in law and sought his salvation in the Christian Reformed Church from then on. Consequently, so did my mother, and her offspring. If my great grandmother could have lived 150 years she would be alternating every Sunday between two churches and compromise the centuries old stumbling block on Predestination. Scratch off one more goal on my list. Revisiting Vietnam, sailing to Holland and now parking “Fleetwood” in front of the house my mother grew up in. Next goals Danube, Mediterranean, West Coast of South America , improving my Spanish. I am abundantly blessed and I thank the Lord for his gifts and protection and I thank my family and friends for their support. I am extremely fortunate to have had parents and grandparents who made this possible. Walking , boating here through de Lemmer I can sense the wonderful childhood my mother had here. She wrote on my request, in her last years, detailed descriptions of her life in this one time saltwater Zuidersea port city. I hope to put this into a book some day. My timing this year to come to de Lemmer is just right. 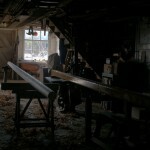 Because the current mast makers who bought the shop from my grandfather in 1926 and continued the same tradition of making wooden masts and blocks are selling the property and the three century old mastmaker legend will come to an end in the next year. Please, go to : http://cometosea.us/albums/albums/DeLemmer/ to compare today’s photos with the ones taken earlier in this same location. Where time stood still. I can sense my mother playing in the wood shavings. Taken around 1917, Same house my mom grew up. My grandfather just in front of Botter Mast. I am moored right in the heart of Lemmer now. On the “Korte Streek” across the store of the family of my aunt Sjaakje- de Vries-Schirm. All the traffic from the Ijselmeer to the lakes of Friesland passes by here. Tomorrow one of the family historians, who grew up in de Lemmer, Roelie Spanjaard-Visser is coming to visit me here. Her website is at http://www.spanvis.nl/index.html she has done a terrific job on the genealogy of our families as well the history of de Lemmer. In the afternoon I intend to push on inland to the Frisian cities of Heeg and Sneek. Writing my blog from "Centrum" in de Lemmer. The wind came up after an hour motoring out of Hoorn, I passed by the Enkhuizen waterfront at noon and arrived in de Lemmer at 4.30 p.m. I almost had to resort to PhotoShop the picture I have wanted to show you for the last years since I decided to sail in Holland. 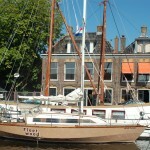 A picture of “Fleetwood” in front of the house where my mother grew up above the mast maker shop. The bridge and lock attendant was nowhere to be found. I am parked in front of the the lock. I have made arrangements with the lock attendant for tomorrow morning. 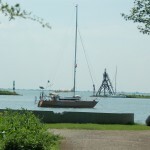 I’ll probably stay in Lemmer till Sunday afternoon and then push on to Sneek. To see my cousin and the Nauta’s who did the Danube and Black Sea voyage in 2008. Yesterday evening I met Cees Jongens in Hoorn. He took me up to the yacht club. We saw the first half of the Holland- Cameroon soccer match. The only other witness who had witnessed against Sonja van Hesteren, see previous blog, Klarie Smeenk is still alive. She is 91. I am trying to visit her. She might be able to answer more of my long lingering questions. I left Monnickendam after 6 p.m. and put the anchor down here in Hoorn at 9 p.m. A gorgeous sail, hard on the wind at hull speed with full main and 140% genoa. I love travelling the oceans but as far as sailing thrills are concerned this is as good as it gets, on smooth water sailing at hull speed and then spending the night in a historic medieval port city from where famous seafarers started their discovery voyages and found the westward route to the South Pacific. Summer has finally arrived. 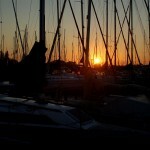 It is in the seventies with a perfect refreshing sailing breeze. I’d like to keep going but I have my external hard drive being checked at the lap top doctor here and it will not be done till late afternoon. I lost all my “Word for Windows” files from the external hard drive. Besides losing all the files on the HP laptop, in Vietnam last February. I got the bad news on the HP laptop as well today, while I stopped by at the shop here in Hoorn where I had left it 6 weeks ago. They tried to take parts from a good identical hard drive and then interchange them on my busted hard drive. It did notwork. This was the fifth attempt, after Saigon, San Francisco, Tacoma, Tampa and for the time being the last attempt until I win the lottery and can afford to take it to the geeks in the white coats and green bonnets. So, all the good pictures of my Vietnam, Cambodia, Laos travels, my e-mails, word processing files from November till March are gone. We all have access to the pictures I sent in these blog updates from that period but they are in a smaller format. And I did the one photo album of the colors of Vietnamese Lunar New Year. 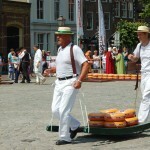 Every Thursday there is a Cheese Market here on the main square in Hoorn. This is a reenactment of the old traditions. The cheese carriers have this special fast dribble when they carry the gurneys to keep their loads level. I’ll stay here one more night and then take off for de Lemmer or Lelystad depending on the wind direction. This evening I get to meet Cees Jongens who lives in Hoorn and just returned from Costa Rica where e left “Lyra” till the end of the hurricane season. “Lyra” is one of the few other boats that also made a stop in Nha Trang, Vietnam in 2008 as I did in 2006. I spent the day in the National Archives in the Hague. My request to examine the files of the war criminal procedures against Sonja van Hesteren were granted. Van Hesteren was a Dutch Nazi sympathizer who was used to trap the leader of my mother’s resistance group. She was sentenced to 12 years and later reduced by a Royal clemency to 9 years. The leader of my mother’s unit died in a German concentration camp just before the war ended. Our mother was liberated at the end of the war by the Americans at Dachau. After our mother passed away I came up with questions she might have been able to answer before. The main question was: ” Why have I never heard of any other names than hers who worked for the leader of this group?” There just have to be more. Last Summer sailing from the Azores to France I had this one in a million stroke of luck to meet the grandson of another woman who worked for the same resistance group leader. We were at that time both being coached on the weather by Herb Hilgenberg on the short wave radio. Bart Boosman was sailing back to Holland after participating in the 2009 OSTAR race. But even though this was a big step forward it still is not a direct connection because even though they, three women, went through the same interrogators, prisons and concentration camps they never had any direct contact with our mother. And today’s search did not answer that question. But there are hours of interesting reading on the events between 1943 and 1947. But the most emotional discovery was the fact that the files include the records of the testimony of one of the German interrogators of the despised SD (Sicherheits Dienst) officer, Emil Ruehl, who reveals from whom he obtained the name of the person who gave away to him the real name of the resistance group leader he was looking for. We knew this person and he and Ruehl are long dead and there is no record in these files if his claim has ever been challenged. These archives will become public records in the near future. My father was arrested two weeks before the leader was caught. He was repeatedly interrogated to obtain the identity of the leader but since my father had nothing to do with the resistance work my mother was involved with he had no idea who this person might be with the “nom de guerre” he used. Once they knew his real name he was phoned and trapped by Sonja van Hesteren on April 20 1944. Then shortly after my mother turned her self in figuring that she could handle the ordeal better than my father. Then they released our father and the rest is history. I can only speculate if my father and mother ever knew of this scenario. But now it does start to make sense out of a number of contacts, or better yet the lack of contacts, between a number of the players, since the war’s end. 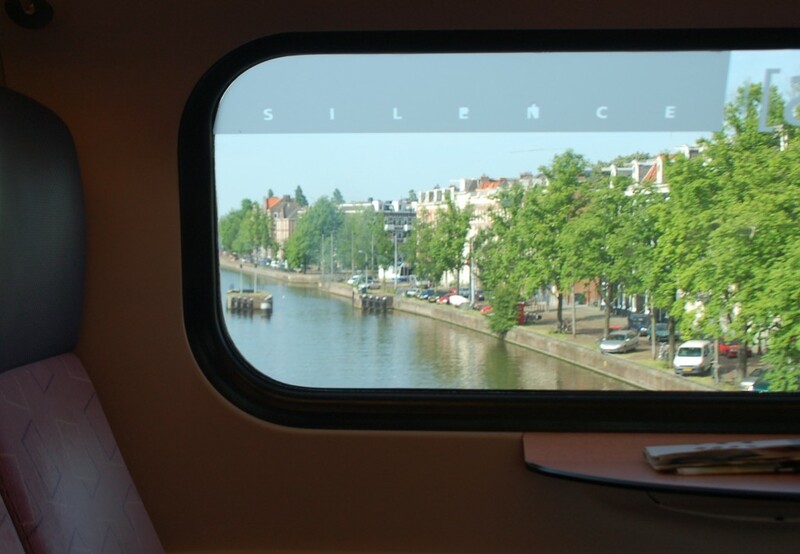 The below picture was taken today from the train on the rail road bridge that just opens for a few minutes in the middle of the night on the Standing Mast Route through Amsterdam. Saturday June 19 Holland’s 2nd victory in the WC soccer. It was a perfect day to watch the Dutch win their second game. 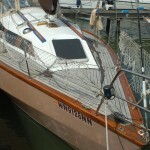 I could not work on the boat since the weather has turned cold and nasty again with frequent showers and gusty winds. 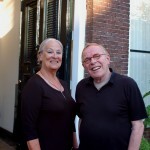 Yesterday Hans and Vonnie v/d Werff came to visit in the morning, next my oldest niece, Marieke, stopped by in the evening Marcus and Carin, my German dock neighbors, came aboard to have a drink. And this evening I cook dinner for my sister Karolien and her husband Herman. So, you see, this solo sailors has social skills after all. Which translates: “A Haircut and a Shave”. And the marina yard here shows a haul out and bottom wash as “Knippen en Scheren”. So, on this subject, I had my $ 27.50 hair cut yesterday. You might remember that my first hair cut in Holland, last August, was $ 35.00 Then the next one was done by Evelyn for free. I can cook, iron, clean house, but I cannot cut my own hair. I am looking for a woman like Maureen. Put the word out. John and Maureen La Vake are from Washington, N.C. , right near the ICW and Pamlico Sound. They showed up yesterday here in Monnickendam in the blue power boat in the background “Liv’n Good” . They have been boating through France and surroundings for the last 6 years. They purchased the boat from an other American in France. They are both from Connecticut, took early retirement and moved to North Carolina. My Alabama friend Roger joined me on their boat and we had a great time this morning exchanging our varied experiences. I hope we stay friends. A nice break between coats of Linear Polyurethane and Cetol on the teak trim. “Fleetwood” is starting to look good again; while removing all the sanding dust I scrubbed the house and cleaned the teak deck which had moss growing on it after the winter snow cover melted. The marina is so enormous and appears much less personal than the atmosphere in Amsterdam at “de Schinkel” but I have met many other sailors. My closest neighbors, who are here on a two week vacation are Karen and Markus from Wuppertal. They have become new friends. Tomorrow I’ll be meeting Hans and Vonnie van der Werff . We started corresponding about ten years ago. They live in Ontario, Canada and are here on vacation in Holland, their former homeland. Hans is a minister/pastor of a Messianic Jewish church. I met their daughter at a Messianic Jewish service in Vancouver many years ago. I found Hans through his web site www.cympm.com when I was doing research on the concentration camp Vught where our mother was kept political prisoner in 1944. I have been very fortunate that it has not rained since I started sanding, last week. I hope to get a couple more coats on and then I plan to start cruising to Friesland by way of Spakenburg, Lelystad, Urk. The World Cup soccer has turned Holland into a frenzy. I watched Monday’s 2-0 Holland-Denmark game in the local pub. I am just going to have to get my orange clogs, orange wig, or whatever. You see the weirdest costumes. The weather has improved, giving me a chance to get on with sanding the teak trim. I am not allowed to use any power sanders in the marina, so my nails are down to the quick. The snow on deck for a good part of the long hard winter in Amsterdam soaked through the varnish and the job turned out much more involved than I had thought. By the end of the week I should be ready to go sailing again. But I got several breaks to day. First to 10 o’clock service. No Gregorian choir and the same 50 or so worshippers in this large100 year old church. But the service was beautiful and the priest seems to take the low attendance in stride and delivered his sermon as if he were preaching in Saint Patrick’s on Madison Avenue to a full house. consisted of two sopranos, two altos, two tenors and two basses. The orchestra played an organ, base, cello, bassoon, two oboes, three violins. The choir started, without accompaniment, with Bruckner’s “Pange Lingua” and ended with Bach’s oratoria “Wer nur den lieben Gott laesst walten”. 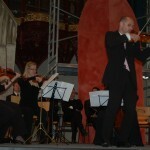 The orchestra played a Sonata from Zelenka, this is where the virtuoso oboe players were very impressive. And a Rondo from G.Rolla with beautiful violin solos. Red in the Morning Fishermen’s warning? I was hoping for some drier weather to get the trim revarnish job finished.